An extract from Daniel Defoe's Journal of the Plague Year, 1722, is quoted in the book and he wrote: "If we came to go into a church when it was anything full of people, there would be such a mixture of smells at the entrance that it was much more strong, though perhaps not so wholesome, than if you were going into an apothecary's or druggist's shop." He goes on to describe the different smells that would be encountered. Full of altruism, I decided to volunteer for Open City, the charity that runs the Open House London weekend. This year doors open on the weekend of 22-23 September. So, if you're a history buff, an architecture geek or just plain nosy and want a peek 'behind the scenes' of normally private or a restricted-access buildings, then check out the link to find out which ones are opening their doors to reveal their secrets during this inspiring weekend. Architecture and scent - unlikely bedfellows you may say? I am not so sure, everything, when you give it closer inspection is inextricably linked. Lets get our lateral-thinking caps on and a moment of your time to explore. What words or images spring to mind when you mention Architecture - it provokes many a discussion of likes, dislikes, of impact on function and environment - like our sense of smell it can provoke a strong response, be subjective and dependent on personal taste. I wonder, would your taste in architecture be reflective of your taste in perfume, for example, could you match your fragrance to your favourite buildings? Do your sensibilities lean to modern, romantic, classical, victorian, futuristic/surreal? The metallic + glass behemoths of Canary Wharf? The petite candy coloured mews houses hiding out in the narrow streets of Notting Hill, Kensington and the like. Have you noticed the link between scent and architecture, how we experience buildings through our sense of smell? It seems on the whole it may actually be the activity associated with the building, rather the building itself that gives rise to the odours associated with it. The activity, the passage of time, our experience and then the building with its scent - all unite, intermingling to become one, and to be embedded in our psyche forever. 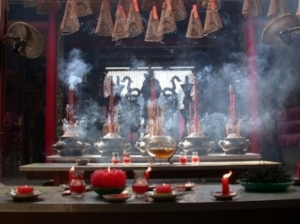 For example, sacred sites and the interaction between religion and smells, with its incense and candles, the smell of rice-paper-thin hymn books, the smell of time and people embedded in the walls and furniture. Bookshops (notably antiquarian and second hand) Libraries - ink, polish, wood, papers, leather, glue, dust, the smell of inspiration, brain-power and the anticipation of knowledge held within (what would that smell like ...sulphur/sweat?). Consider the materials that are used, are they locally produced, what is their environmental impact both from the source and in final 'product'; why are they chosen? Behind each 'ingredient' there is a story, a history, a sense of traceability. Like a perfume, a building possess the power to create an atmosphere and the evoke a sense of a time+place. There are particular buildings that are synonymous with their landscape and representative of an era in history (like a fragrance or smell), they become representative of the passage of time; the imprints of activities and people it is witness to; such as pubs, churches, shops, schools which may each have their own aromatic identity. Perfumery uses many metaphors and adjectives related to architecture and the tangibility of the physically built environment. I have found when others (as well as myself!) describe scent, the language used to describe it and how it makes them feel usually overlaps with language relating to sense of space, and of rooms or buildings, for example elevated, airy, spacious - like a high ceilinged room -, oppressive, opulent, cavernous (underground cellar); also, "like a morrocan bazaar", "reminds me of Temples and places of worship" or "the inside of a Victorian apothecary" (as one might imagine it!) ..etc! They share a sense of balance of composition; like architecture, perfume construction likes to challenge perception. A fragrance, if well structured has 'a journey' as the odour molecules merge and dry down, evolving over time to reveal its secrets and its character - it tells a story. A building or structure tells a story, allowing you to travel; either journeying with your eyes leading you to a focal point or to physically take you to an end point. Lloyds Building Staircase – like a metallic centipede! Hmm, lots of food for thought. Does anyone have a FAVOURITE building or related scent memory - I would love to hear about it! In the meantime, I am prepping myself for the weekend, lots of notes to read. I will be at the Royal Geographic Society on Saturday and The Brunel Museum on Sunday (they have a great timetable of activities planned). Hope you get to visit one of the amazing gems on offer. NB: there is a Perfumer who trained as an Architect, I have seen his perfumes advertised in Sunday magazines, but the name escapes me for the moment, drat, typical!